We all have them. I'm no different - and most of mine are meaningful, the sort of baggage that comes from living for over half a century. (Ugh. I regret writing my age that way - it sounds so... ugly.) But I have one that I've carried since the mid-eighties that probably isn't one most people would identify with. It's one that stings me now as much as it did the moment that I realized I'd made a terrible, terrible mistake. I realized that I'd ruined my first and favorite set of dice. Yep, that's what I said: one of my most painful regrets is that I ruined a set of dice. Process that. Laugh at me. Pity my pettiness. Do what you must, and - when you're over it - read on. All of my friends started playing Dungeons & Dragons at the same time. And I think we all had different products that got us into the game. For me, it was the Moldvay-edited D&D Basic Set. For my best friend, it was Holmes Basic D&D. One thing's for sure: none of us had the same dice. And I loved mine. 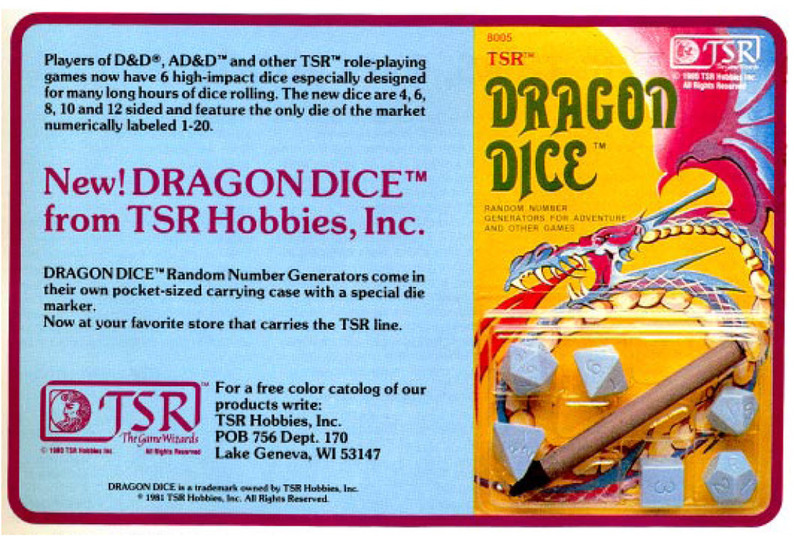 They were the lightweight TSR dice that were prevalent in 1981. Mine, however, were unlike any I'd seen elsewhere - they were a mixed set, several of them being marbleized white-and-pink, except for the d4 and the d20, which were harder plastic and solid red. I absolutely cherished those dice. As the years of the early '80s passed and new games came along (Star Frontiers, Gamma World, Top Secret, Gangbusters, Villains & Vigilantes), I added their dice to my growing collection. I also added a few stand-alone sets of TSR's Dragon Dice. Eventually, my collection of dice became so large that I needed a better way to store them than in my game boxes, so I purchased a blue, velvet dice bag from my FLGS. All of my dice fit snugly into the bag; most of them were the soft plastic-style dice, except for the dice that came in my Gamma World set, which were a hard, sharp-edged plastic. All was good with the world. Until the day my nephew and I got bored and needed to burn off some youthful energy. We started by tossing my dice bag back and forth. And then we had the brilliant idea to use it as an improvised hacky sack. It was an oddly satisfying feeling, that slightly crunchy "Smack!" when foot met dice bag. I still recall how my heart sank when I opened the bag afterward and saw what I'd done. Everything was fine, until I got to my D&D dice. They were frayed, as if I'd taken a rough file to them, and they rolled about as well as one would expect light, frayed-edged dice to roll. Apparently, the sharp edges of the Gamma World dice had attacked and destroyed my favorite set of dice. (All of the other soft dice were unscathed - a statistical improbability that I can only translate as the Universe taking this opportunity to teach me a lesson...) I was heartbroken. I tried to move on, and as the '90s rolled in - and all of their new games and new dice with them - I put away my old dice and tried to forget what I'd done. But old pains are hard to keep suppressed, and as the late 2000's came and I began regularly playing Basic D&D again, that particular pain began to hurt anew. As part of my renewed interest in the old games, I began purchasing early TSR products, including multiple sets of Basic and Expert D&D. 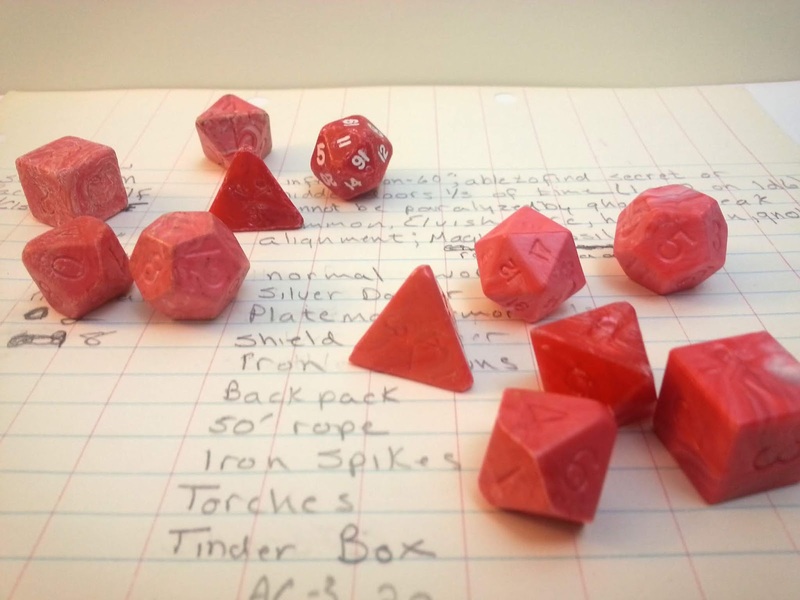 And each time, I secretly hoped I'd find a new set of pink-and-white and red dice to replace the ones I'd ruined and right that old wrong. I soon discovered, however, that the damage had been greater than I first thought. The dice turned out to be rarer than had been hinted at within my small game group's sets of dice. I scoured eBay, day after day, week after week. And although I saw many sets of old TSR dice, I never once saw a set of dice that looked like my first set. I began to lose hope and to reconcile myself to potentially having to live with my decades-old mistake. Then, finally, I found a set as part of an auction for a near mint Moldvay Basic D&D box set. I hesitated, as the price of the set was a bit high. But in the end, buying the set was never really in question - my mistake some 30 years ago had seen to that. I've had these now for a couple of years. (I gave the D&D Basic set to a friend, along with a different set of TSR dice.) They're not exactly the same as my old set - they're all the marbleized soft plastic, no solid red dice. But they're close enough that they soften the pain of my youthful folly. And they give me hope that I may, someday, be able to put this particular regret away for good.